Day after day, you set a positive example for your peers. I watch you tirelessly follow the rules, typically with a smile on your face. But, ultimately, we’re all human. We all make choices, and occasionally, mistakes. I have two younger sisters. We’ve always been the best of friends, but there have been moments when we haven’t exactly seen eye-to-eye. When I was in first grade, my sister Lauren was in kindergarten. She was learning to spell her name, and I was learning to tie my shoes. Life was pretty simple back then. One day, we got into a petty argument over one of my Barbie dolls. Ten minutes later, stewing in time-out, I eyed the wooden coffee table in arm’s reach. My mind reeled with the injustice of the situation. It was my doll. My right to play with her whenever I wanted to. Why was I sitting in timeout? This morning, when you walked into school, you had a decision to make. Leave the iPhone in your pocket? Or follow school policy and turn it in at the front desk? Were you simply tired of doing the right thing, making a purposeful choice to keep the phone with you? Or was it an accident? Did you honestly forget that you still had it? My mom’s gasp reverberated throughout the house. Unsuspecting, cheerful Lauren skipped into the living room. Six letters carved with kindergarten-esque penmanship marred the coffee table. A shrill, clipped noise jarred my otherwise silent classroom. Students erupted into chaos. 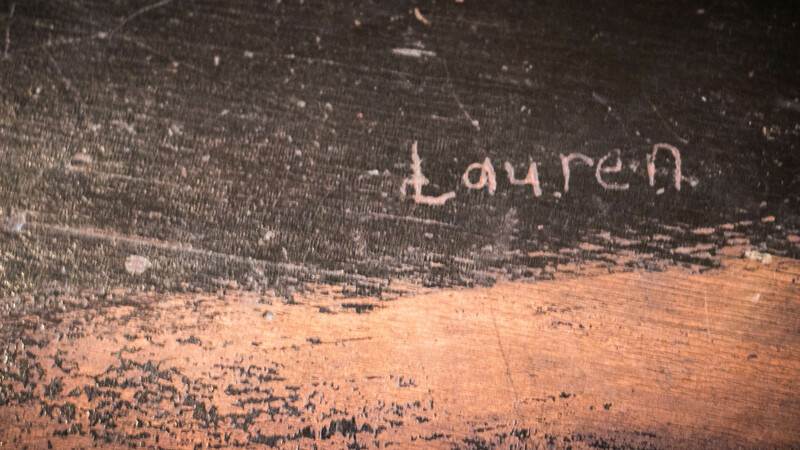 I let it go on too long: Lauren’s insistence that she did not carve her own name into the table and my mom’s bewildered investigation. Sitting in my room, playing with the coveted Barbie doll, I felt prideful, even elated, that I had found the most clever way to get back at my sister for attempting to steal my toy, my fun. I heard Lauren start to sniffle, as she promised over and over that she didn’t commit this outrageous deed. Something inside my cold, dark heart began to melt. Am I the kind of person who does something like this? I wondered aloud to the plastic, too perfect, 12-inch friend in my hand. The weight of that cell phone was heavy, wasn’t it? The glow of the screen illuminated who you are and what decisions you make under pressure. Is this what I want to be known for? Cheating on a quiz? “I carved her name in the table,” my voice, dripping with shame, cut through the tension in the living room. I had to drop the emotional weight I was carrying, even though I knew it would be painful and embarrassing. I had been cruel; I had lied. But I didn’t want to be that person anymore. So I confessed, and I traded my guilt for a just punishment. You are not a liar. You proved that today when you were the first student in the cellphone cheating scandal to step forward. Two other students have also admitted that they were involved, following your positive example yet again. Believe it or not, my mom still has that coffee table. It’s covered with a white, lacy tablecloth, a symbol that my egregious sin was forgiven. But sometimes, Lauren and I move the lamp and the stack of heavy books, fold up the tablecloth and run our fingers along the curves of the letters of her name. This decision will follow you. Just like the scarred coffee table, you won’t ever be able to completely erase this mistake, but you certainly can move forward. In college, you can be removed from a class or expelled from a university altogether for cheating. Let being caught in the 6th grade be your ruined coffee table. Let it be a reminder to you that a decision to lie, cheat and not be true to yourself is never worth it. Remember who you are and who you are not. This entry was tagged cheating, courage, growing up, honesty, humor, life, mentorship. Bookmark the permalink. We’re a group of volunteers and opening a brand new school in our community. Your site offered us with useful information to work on. You have done an impressive task and our entire neighborhood can be grateful to you. Bernardo, thank you for leaving this comment. I am honored that your group found my blog useful! Thank you for the work you are doing in your community. This is truly a team effort in every way. Please let me know if I can be of assistance in the future.